January 24, 2018 – Sierra Nevada Corporation’s (SNC) Space Test Program Mission 5 (STPSat-5) satellite moved another step closer to launch, successfully completing its Factory Compatibility Test (FCT) with NASA’s Near-Earth Network and the NASA Ames Multi-Mission Operations Center. 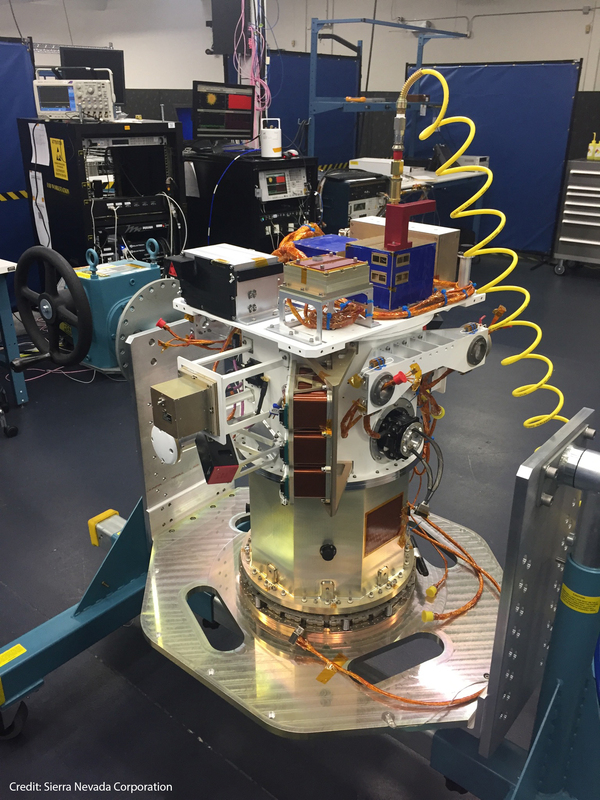 STPSat-5 hosts five Department of Defense (DoD) experiments to test emerging space technologies and is expected to launch in 2018. SNC completed mechanical integration in September, stacking three functional modules (propulsion, bus and payload deck) to form the complete space vehicle. Completion of FCT demonstrates both radio frequency (RF) interfaces and end-to-end compatibility of the STPSat-5 space vehicle with the ground systems used for command and control once the vehicle is on-orbit. With successful completion of the FCT, the space vehicle is proceeding into final system-level functional and environmental testing, including random vibration and thermal vacuum, prior to its shipment to the launch site. The STPSat-5 payloads are provided by Space and Naval Warfare Systems Command, the U.S. Air Force Academy, the Naval Research Laboratory, and the Air Force Research Laboratory. As the prime contractor, SNC designed and built the STPSat-5 spacecraft and integrated the government payloads. STPSat-5 is the first mission to fly SNC’s versatile SN-50 bus, which has both Low-Earth Orbit and Geosynchronous-Earth Orbit capabilities. The vehicle is fully compatible with the standard Evolved Expendable Launch Vehicle (EELV) Secondary Payload Adapter and is an ideal choice for a variety of operational, technology demonstration, and science missions.